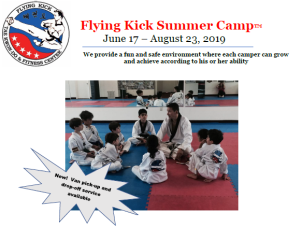 Flying Kick Fitness welcomes you to our website! Learn more about our school by checking out our video gallery! Our Summer Camp enrollment packet is just a click away! Space is first-come first served, so reserve a spot for your child now. We are excited to launch our after-school program at the studio beginning this Fall. The program runs Monday through Friday from 3:30-6:30pm. Students will be picked up at Westland Middle School and Bethesda Elementary and brought to the Flying Kick Studio in our Flying Kick van. Parents can pick up between 5:30 and 6:30pm.